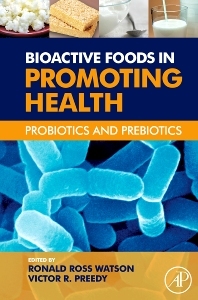 Bioactive Foods in Promoting Health: Probiotics and Prebiotics brings together experts working on the different aspects of supplementation, foods, and bacterial preparations, in health promotion and disease prevention, to provide current scientific information, as well as providing a framework upon which to build clinical disease treatment studies. Since common dietary bacterial preparations are over-the-counter and readily available, this book will be useful to the growing nutrition, food science, and natural product community that will use it as a resource in identifying dietary behavioral modifications in pursuit of improved health as well as for treatment of specific disease, as it focuses on the growing body of knowledge of the role of various bacteria in reducing disease risk and disease. Probiotics are now a multi-billion-dollar, dietary supplement business which is built upon extremely little research data. In order to follow the 1994 ruling, the U.S. Food and Drug Administration with the support of Congress is currently pushing this industry to base its claims and products on scientific research. Research as shown that dietary habits need to be altered for most people whether for continued or improved good health. The conclusions and recommendations from the various chapters in this book will provide a basis for those important factors of change by industry with new uses. Animal studies and early clinical ones will lead to new uses and studies. Particularly the cutting edge experimental and clinical studies from Europe will provide novel approaches to clinical uses through their innovative new studies. Research microbiologists and food scientists employed in academics, Industrially employed dieticians, microbiologists, nutritionists, and food scientists as there is a growing market for various types of prebiotics and probiotics, to a lesser extend regulators at places like the U.S. Food and Drug Administration, U.S. Department of Agriculture and people in state and city health departments, and physicians, dieticians etc in the health care complex as there is increasing evidence as well as interest in the real and/or postulated health benefits and uses in disease treatment There will be high international interest (Europe and Japan) as a significant part of the ongoing research and the authors are non-U.S.